This is a season long challenge. It is free to enter for members only. It helps each member earn more SRFC Points towards the Member of the Year Grande Prize each week. You must register for this event on our website at Susquehannafishingclub.com. The member with the most SRFC Weekly Catch approved submissions will be the winner. Each Angler will be allowed one submission a week. Winner of this event is guaranteed a $100 Gift Card to Bass Pro shops. In the event of a tie, the member who submits a CPR first on the final week of the challenge will be declared the winner. Additional prizes may be included during the season pending sponsor involvement. Each week in the “Secret Members Only Group Forums”, The Event admins will instruct you as to what the weekly marker will be, in order to display it with any species you catch every week! You will be awarded 10 SRFC points, once a week for providing a Catch-photo-release submission. Acceptable catches, Terms and Conditions, and Rules and Regulations can be found below. You can register for this Challenge on iAngler Tournament Systems. SRFC Pro-staff are not eligible for this Challenge. All fishing locations must be in waters accessible to the public at all times according to state and federal regulations. Only fish caught in the Susquehanna River, the Gunpowder River, and the Potomac River will count. Fish caught in a tributary of the Susquehanna River, the Gunpowder River, and the Potomac River will count as long as the fish is caught within 1 mile of the river. This is tracked through GPS and determined when you submit your photo via iAngler. Loch Raven Reservoir will also be in the acceptable boundaries and its tributaries within 1 mile of the Reservoir. Rules and Regulations 1. PARTICIPATION AND ELIGIBILITY. Participation is open to anyone 18 years of age or older. Minors are eligible to participate with a parent or legal guardian signature on the release form. A completed registration form, waiver, and entry fees must be received in order to participate. 2. Captain’s Meeting. This is a member only event. All members must register through iAngler Tournament System. 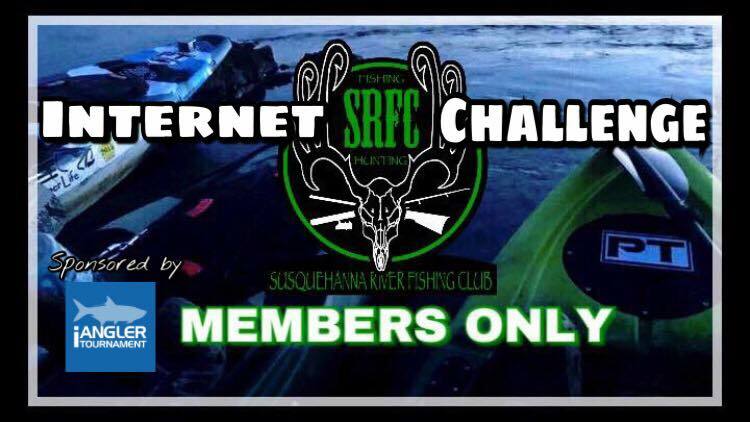 You must create a profile and register using your SRFC Member Only Code, provided in the Member Only Forum area of our club website, in order to fish the event. Attendance at the Captain’s Meeting is not required. Each week you can find the weekly catch marker in the Member Only Forums and Groups, as directed by the Tournament Director. Should the need arise for an angler to miss the Captains Meeting; they should simply refer back to the direction given on these platforms. It is the angler’s responsibility to get all the information pertaining to the challenge and the weekly direction. Your uniform measuring device shall be purchased by the angler. SRFC Badges will be given to you in person or mailed to you at the convenience of the Susquehanna River Fishing Club. The uniform measuring device and SRFC Badge may not be given to a stand in representative. The Captain’s Meetings will be on Mondays at various times. The Meeting will be located on Facebook SRFC Members Only Facebook Group and Members only Forums. 3. CHECK IN. Check in will be done with iAngler Tournament Systems 4. SPORTSMANSHIP. Competitors in the SRFC Weekly Catch Challenge are expected to follow high standards of sportsmanship, courtesy, safety and conservation. Any infraction of these fundamental sporting principles may be deemed cause for disqualification. Maximum courtesy must be practiced at all times, especially with regard to boating and angling in the vicinity of non-competitors who may be on tournament waters. Any act of a competitor, which reflects unfavorably upon the SRFC’s effort to promote fisheries conservation, clean waters, or abuse, conviction of a felony or other crimes involving moral turpitude or other conduct reflecting unfavorably upon the SRFC efforts to promote safety, sportsmanship and compliance with tournament rules shall be grounds for rejecting any application for participation and for disqualification. Any act deemed by the Tournament Director that gives an angler an unfair advantage not specifically covered under this set of rules shall be grounds for disqualification. Any violation by an angler deemed intentional or preconceived by the Tournament Director to gain an unfair advantage, would be grounds for permanent disqualification. 5. PERMITTED FISHING METHODS. All fish must be caught, photographed, and released alive in a conventional sporting manner. All fish must be caught with hook and line. A foul hooked fish will not be scored. A foul hooked fish is defined as a fish that does not have at least one hook in its mouth, and it must be released. Anglers may not catch fish or submit fish that have been caged or confined in an area prior to the tournament. During the hours of competition, contestants may not obtain or receive assistance, including but not limited to the following: a non-competitor’s boat, the placing of markers by a non-competitor. All fish caught and submitted, must be done so in accordance with the law, and in season, by legal means. 6. TACKLE AND EQUIPMENT. All live and artificial lures may be used during competition. Commercially sold pork trailers or scents may be added and used. Fishing rods and reels only, no nets, bows, guns, traps, or any other means. 7. PERMITTED FISHING LOCATIONS. All fishing locations must be in waters accessible to the public at all times according to state and federal regulations. Only fish caught in the Susquehanna River will count. Fish caught in a tributary of the Susquehanna River will count as long as the fish is caught within 1 mile of the river. This is tracked through GPS and determined when you submit your photo via iAngler. 8. SCORING. The event uses catch-photo-release scoring determined by your photo submission on the tournament app. Any species of fish caught by legal means and during legal catch season as stated by law in your area, will be scored towards this challenge. Each angler may use a “Hawg Trough” measuring device or hand hold the fish. A unique scoring marker/token you received at the Captain’s Meeting must be placed in the photo. Each fish should be measured on the issued measuring device or hand held and photographed with the marker/token indicator provided to the angler, clearly showing the species of the fish with the scoring marker. More than one photo of a fish may be taken. Fish must be above the state minimums to count - fish may be above the slot limit. In the event of a tie the entry checked in earliest the last week of the tournament will be declared the winner. The Tournament Director will review the photos to verify reported results and determine place winners. The Tournament Director is responsible for the final call in all matters. All scoring will be done using cellphones and the IAngler Tournament App. You must register and watch the instructional videos prior to competition. Due to undeterminable times you will be fishing throughout the year, submitted catches will be approved at the leisure of the Susquehanna River Fishing Club throughout each week. Once your catch has been approved it will go on the leaderboard approved in iAngler and posted on Member Forums. At this time you will receive your 10 SRFC Point Credit towards the grande prize as well. You may visit and view your standings at any time. 9. DIGITAL PHOTOGRAPHY. Participants may only use digital cameras from there smart phones or tablets for recording scoring fish (cameras may not be shared by competitors). Images may not be digitally altered or enhanced in any way. Anglers should shoot images at maximum resolution possible. Upon photograph of each entered fish, each photograph must be sent immediately to the provided iAngler Tournament App. GPS must be revealed. A constant to barrage of mass entries may occur on tournament day in the event many fish are caught by anglers. This provides constant updates of tournament standings. We will verify catches within 30-60 seconds so you can release the fish as soon as possible. 10. RELEASE OF LIABILITY AND COVENANT NOT TO SUE. A waiver, release of liability, and covenant not to sue are part of the entry form. It is required that all contestants take responsibility for themselves while participating in event activities. Please sign, scan, and email back to srfishingclub@gmail.com 11. PHOTO RELEASE. Scoring photos remain the sole ownership of the Susquehanna River Fishing Club. Contestants grant the SRFC and the sponsors the unconditional right to use their name, voice, photographic likeness and biographical information in connection with SRFC tournaments, production, promotion, and/or articles and press releases, and shall not be entitled to receive any royalties or other compensation in connection with such use. 12. RULE CHANGES. Rules interpretation is exclusively left to the Tournament Director. The decisions of the Tournament Director are final in all matters and are not subject to appeal. 13. CONTINGENCY PRIZES. Sponsors may at their discretion award contingency prizes for anglers winning or placing using their products. 14. Grand Prize. This Challenge is meant to help you buffer your SRFC Points for the Annual Grande Prize. You can earn a maximum of 10 points per week towards this prize while competing in this Challenge. 2. Captain’s Meeting. This is a member only event. All members must register through iAngler Tournament System. You must create a profile and register using your SRFC Member Only Code, provided in the Member Only Forum area of our club website, in order to fish the event. Attendance at the Captain’s Meeting is not required. Each week you can find the weekly catch marker in the Member Only Forums and Groups, as directed by the Tournament Director. Should the need arise for an angler to miss the Captains Meeting; they should simply refer back to the direction given on these platforms. It is the angler’s responsibility to get all the information pertaining to the challenge and the weekly direction. Your uniform measuring device shall be purchased by the angler. SRFC Badges will be given to you in person or mailed to you at the convenience of the Susquehanna River Fishing Club. The uniform measuring device and SRFC Badge may not be given to a stand in representative. The Captain’s Meetings will be on Mondays at various times. The Meeting will be located on Facebook SRFC Members Only Facebook Group and Members only Forums. 5. PERMITTED FISHING METHODS. All fish must be caught, photographed, and released alive in a conventional sporting manner. All fish must be caught with hook and line. A foul hooked fish will not be scored. A foul hooked fish is defined as a fish that does not have at least one hook in its mouth, and it must be released. Anglers may not catch fish or submit fish that have been caged or confined in an area prior to the tournament. During the hours of competition, contestants may not obtain or receive assistance, including but not limited to the following: a non-competitor’s boat, the placing of markers by a non-competitor. All fish caught and submitted, must be done so in accordance with the law, and in season, by legal means. 6. TACKLE AND EQUIPMENT. All live and artificial lures may be used during competition. Commercially sold pork trailers or scents may be added and used. Fishing rods and reels only, no nets, bows, guns, traps, or any other means. 7. PERMITTED FISHING LOCATIONS. All fishing locations must be in waters accessible to the public at all times according to state and federal regulations. Only fish caught in the Susquehanna River, the Gunpowder River, and the Potomac River will count. Fish caught in a tributary of the Susquehanna River, the Gunpowder River, and the Potomac River will count as long as the fish is caught within 1 mile of the river. This is tracked through GPS and determined when you submit your photo via iAngler. Loch Raven Reservoir will also be in the acceptable boundaries and its tributaries within 1 mile of the Reservoir. 8. SCORING. The event uses catch-photo-release scoring determined by your photo submission on the tournament app. Any species of fish caught by legal means and during legal catch season as stated by law in your area will be scored towards this challenge. Each angler may use a “Hawg Trough” measuring device or hand hold the fish. A unique scoring marker/token you received at the Captain’s Meeting must be placed in the photo. Each fish should be measured on the issued measuring device or hand held and photographed with the marker/token indicator provided to the angler, clearly showing the species of the fish with the scoring marker. More than one photo of a fish may be taken. Fish must be above the state minimums to count - fish may be above the slot limit. In the event of a tie the entry checked in earliest the last week of the tournament will be declared the winner. The Tournament Director will review the photos to verify reported results and determine place winners. The Tournament Director is responsible for the final call in all matters. All scoring will be done using cellphones and the IAngler Tournament App. You must register and watch the instructional videos prior to competition. Due to undeterminable times you will be fishing throughout the year, submitted catches will be approved at the leisure of the Susquehanna River Fishing Club throughout each week. Once your catch has been approved it will go on the leaderboard approved in iAngler and posted on Member Forums. At this time you will receive your 10 SRFC Point Credit towards the grande prize as well. You may visit and view your standings at any time. 9. DIGITAL PHOTOGRAPHY. Participants may only use digital cameras from there smart phones or tablets for recording scoring fish (cameras may not be shared by competitors). Images may not be digitally altered or enhanced in any way. Anglers should shoot images at maximum resolution possible. Upon photograph of each entered fish, each photograph must be sent immediately to the provided iAngler Tournament App. GPS must be revealed. A constant to barrage of mass entries may occur on tournament day in the event many fish are caught by anglers. This provides constant updates of tournament standings. We will verify catches within 30-60 seconds so you can release the fish as soon as possible. 12. RULE CHANGES. Rules interpretation is exclusively left to the Tournament Director. The decisions of the Tournament Director are final in all matters and are not subject to appeal. 14. Grand Prize. This Challenge is meant to help you buffer your SRFC Points for the Annual Grande Prize. You can earn a maximum of 10 points per week towards this prize while competing in this Challenge.